Robert Craig McClure was born April 29th 1952 at Oakland, California. The five foot eleven left handed pitcher, attended the College of San Mateo, getting drafted in the third round of the 1973 amateur draft. McClure moved up quickly, finding himself in the majors by late August 1975. He debuted finishing out a 3-0 loss in Baltimore to the Orioles. On August 16th, he earned career save #1, coming against the AL New York team. In his last outing of the year he earned his first career win as well. He spent most of 1976 in the minors & in March of 1977 was sent to the Milwaukee Brewers as a player to be named later in a deal that also sent Jamie Quirk & Jim Wohlford to the Brewers. Kansas City received Darrell Porter & Jim Colborn. McClure would spend ten years in Milwaukee making the post season twice (1981 & 1982). He spent his first five years with the Brewers as a reliever leading the team in saves in 1978 with nine & again in 1980 with ten. 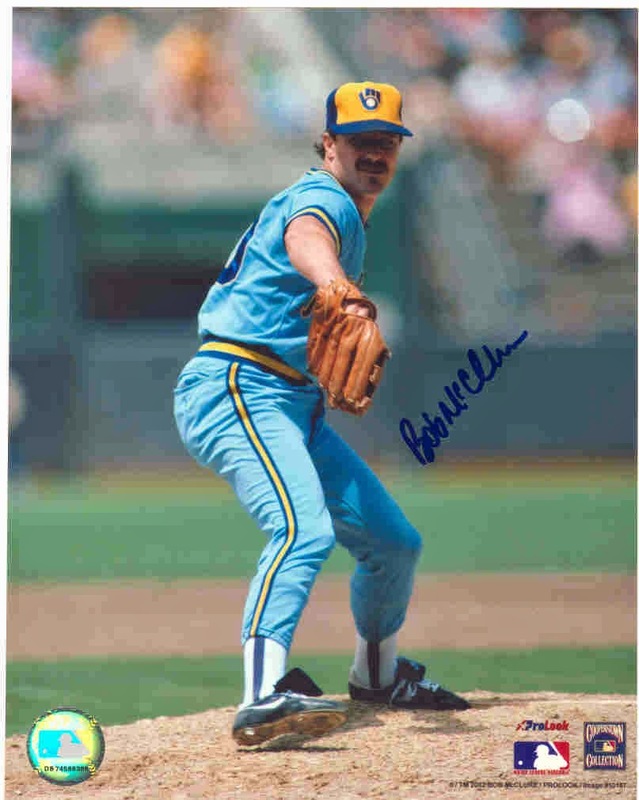 After battling arm issues most of the strike shortened 1981 season, he was ready for the playoffs, as the Brewers made their first post season appearance. He would pitch in three games of the ALDS earning a hold in Game #4. In 1982 he was converted to a starter & found himself on one of baseballs best teams. McClure went 12-7, third on the staff of Pete Vuckovich (18-6) & Mike Cauldwell (17-13) for Harvey Kuenn's A.L. Champion "Brew Crew", also known as "Harvey's Wall Bangers". In the ALCS against the California Angels, he was the Game #1 winning pitcher. He pitched 1.2 scoreless innings, as the Brwers won the game on a Cecil Cooper RBI single. In the World Series against the St. Louis Cardinals he appeared in five games, going 0-2 while earning saves in Games Four & Five. 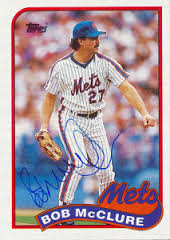 In Game #7 it was McClure that allowed a 6th inning bases loaded single to Keith Hernandez, tying up the game. He then gave up what would be the game winning run to George Hendrick, as he took the loss. Overall in nine post season career games he is 1-2 with two saves, a hold & a 1.93 ERA. The journeyman pitcher would go to the Montreal Expos (1986-1987) & back to Montreal in 1988. He was released & signed by the New York Mets in mid June. 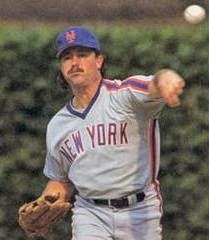 McClure debuted with the Mets, on July 14th, in Atlanta getting credit for a hold in a 7-2 Mets win. On August 6th, he earned his only Mets win, pitching a scoreless 7th inning against the Pirates in Pittsburgh. On October 1st, he earned a save against the St. Louis Cardinals. He did not pitch in the Mets post season. In his brief Mets career lasting just 2 1/2 months, he was 1-0 with a save & a 4.09 ERA in 14 appearances. He would go to the California Angels (1989-1991) St. Louis Cardinals (1991-1992) & finish his playing career with the expansion Florida Marlins in 1993. In a 19 year career, he was 68-57 with 52 saves. He struck out 701 batters walked 497 in 1158 innings over 698 games. Retirement: After his pitching days he began a long career of coaching. He coached with the Colorado Rockies organization (1999-2005). He then went to the Kansas City Royals from 2006-2011. In 2012 he was Bobby Valentines pitching coach with the Boston Red Sox, but as the team struggled he was let go in late August. He was replaced by Randy Niemann. 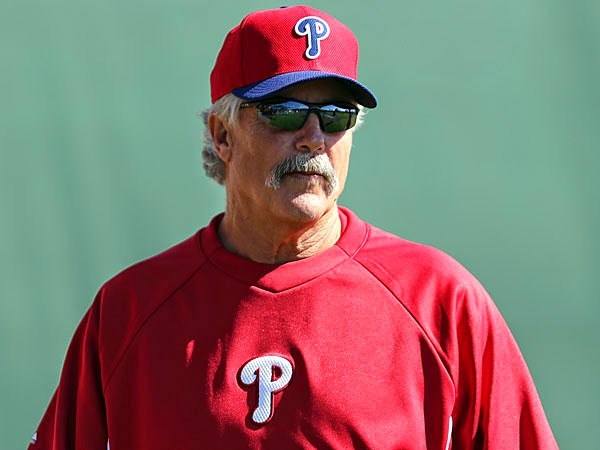 In 2014 he was named pitching coach for the Philadelphia Phillies.